Ornamental or otherwise special material on the front side or outside of a wall. 1. A veneer of nonstructural material such as stone, terra-cotta, metal, stucco, plaster, and wood used to finish the surface of a rougher or less attractive material. 2. 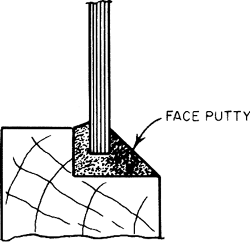 Any material, forming a part of a wall, used as a finished surface; a revetment. 3. On thermal insulation, the protective, functional, or decorative surface applied at the outermost layer of insulation.